Microsoft has launched the Windows 10 operating system on last year but some of the users they still using the Windows 7 most of the user are ok with the Windows 7 OS. If any problem with the machine is any virus malware attack in the system they want to install the new copy of the operating system in the machine. But they do not have an operating system file disk with them. If they purchase the Windows 7 operating system they can easily Download the Windows 7 OS file free on Microsoft website legally. How to download the Windows 7 OS legally. You can download the Windows 7 OS legally by OEM. What is OEM? 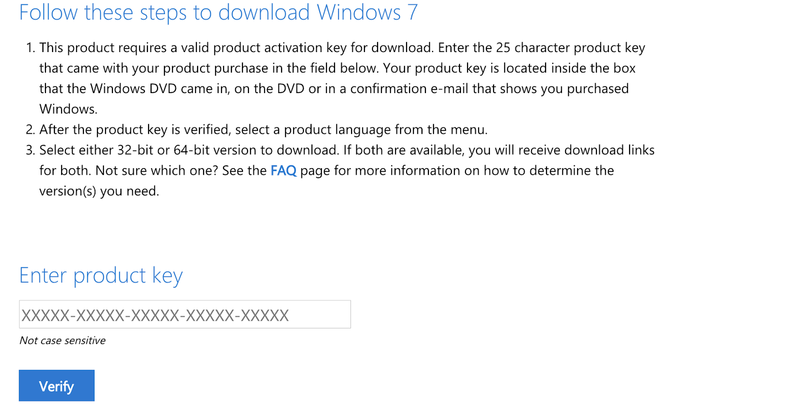 Using the product key, you can reinstall a clean copy of Windows 7, free of all the bloatware and spyware some manufacturers have packed in. Microsoft used to make Windows 7 ISOs available for download through Digital River. However, since February 2015, they have been unavailable. Instead, the company has made the disk images available on its own website. Navigate to Microsoft’s official download page. Scroll down to the bottom of the page and enter your product key. Select either the 32-bit or 64-bit version. To install your clean copy of Windows 7, you need to boot from the USB drive. To boot from the drive, open your computer’s BIOS menu during the boot process. The button varies between manufacturers, but it’s typically Escape or one of the Function keys.